As the year comes to a close, we are all looking for simple fun lessons that still get in a bit of teaching but will hold the children’s attention as their thoughts wonder to summer activities ….as do ours! Here is such a lesson! I did it with my first grade and they loved it! I was in Target a while back and I found these cool magnets in the shapes of “spring” things. There were flowers, snakes (yeah, I’m not sure why snakes are in there, as well! 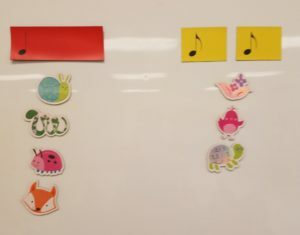 ), lady bugs, etc.… I had the idea of categorizing each magnet into either one syllable, so it was in the “red” category or 2 syllables, so it would be in the “yellow” category. The above photo is what we ended up with. “Red” items were a snail, snake, bug and fox, while “yellow” items were a flower, chickee and turtle. We spoke about what we would call each and how that determined which category it would go into. The chickee, for example, could simply be a “chick” ~ one syllable or a “chickee” or “chicken” both with 2 syllables. We had to name it before we could categorize it (…a little science thrown in for good measure!). This activity lasted about 10 minutes, if that, and got the kids thinking! You could easily use this if you had some time left or as a starter as you get the class going! Let us know below short fun activities that you do with your kids this time of year!